Happy Chanukah! 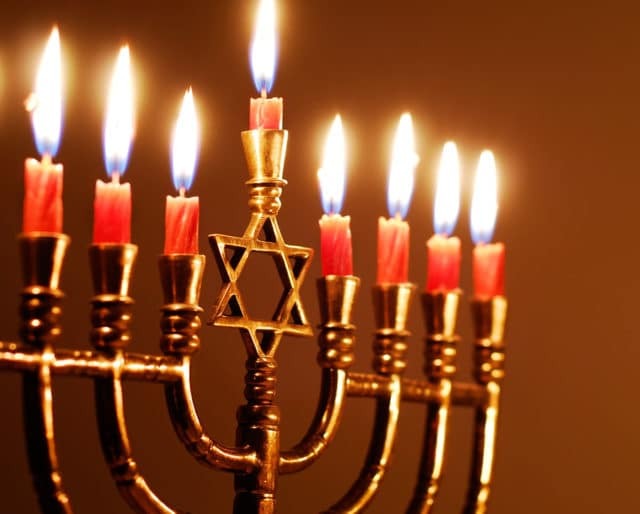 The Jewish Festival of Rededication, also called the Festival of Lights, is an eight-day celebration that falls each year on the Hebrew calendar date of 25 Kislev, which falls on December in the Gregorian calendar. (In 2019, Chanukah is December 22 through December 30.) Chanukah, also spelled Chanukkah or Hanukkah, celebrates the rededication of the second Jewish temple in Jerusalem. It’s not a very important religious holiday, but it’s a fun one, and its proximity to the “Holiday Season” means that it has become one of the most well-known holidays on the Jewish calendar! Each night of Chanukah, use the “shamash” or head candle to light one of the eight candles in the menorah, so by the last night of Chanukah, all eight candles are burning! Gold-foil-wrapped chocolate coins known gelt are traditional Chanukah treats. The tradition harkens back to the Maccabees producing their own money after defeating the Greeks! A dreidel is a traditional four-sided spinning toy. Each side has a Hebrew letter on it: “nun" means do nothing; "shin" means you put one in; "he" means you get half of what's in the middle; and "gimel” means you get the whole pot. Play with gelt or with real money for a great time! Chanukah is a celebration of the Jewish victory over a tyrant king and a rededication of the Temple in Jerusalem. The Jews fought for freedom and reclaimed their holy temple; in order to rededicate it, they needed to light the menorah, but only had enough oil for one day. Miraculously, the oil burned for eight days. Chanukah is an eight-day celebration to commemorate the eight-day miracle. Chanukah isn’t just one night of fun, it’s eight nights of fun! That means eight nights to come together with your loved ones to light the menorah, eat a warming meal, and yes, exchange gifts! It’s traditional on Chanukah to pay homage to the miraculous oil by eating foods fried in oil! That means delicious latkes, which are fried potato pancakes, and sweet jelly doughnuts.